Ding! Ding! The dinner bell just rang! Summer is all about camps and cottages, and visiting with friends at grand lakeside lodges. It’s about relaxing on a warm summer night for conversation, freshly grilled foods and laughter. 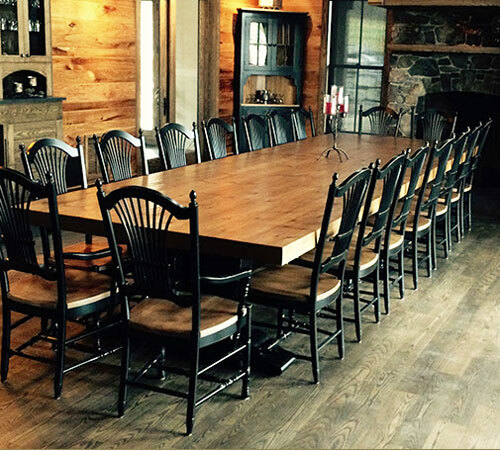 Recently, our workshop was tasked with building a table that was as grand as the great lodge home it was going to reside in. The criteria was; it had to seat 18 people, have a thick, rustic top, and, have lots of legroom for guests. Afterall, who wants to be the person who has to straddle the table leg during a long dinner party? The Table: 15′ by 50″ wide, 3 1/2″ thick table top, with three massive trestle bases. See our standard Chateaux Trestle Table for size comparison. The Color: Black with Natural Stained Top to complement the dark, and natural wood tones of the home. The Chairs: Wheatsheaf Chairs with wood seat stained natural, to match table top. Just think about the feast and frivolity that can happen here with 18 guests. It’s a table fit for a king, or at least a few of your closest besties! Let’s eat.